Phiaton (pronounced FEE’ ah ton) derives its name from the Greek letter ? or “Phi” which was often used to represent the golden ratio. “Ton” has a double-meaning. It’s a nod to the word “tone,” which in English refers to the character and quality of sound. In French, “ton” to mean fashionable style. 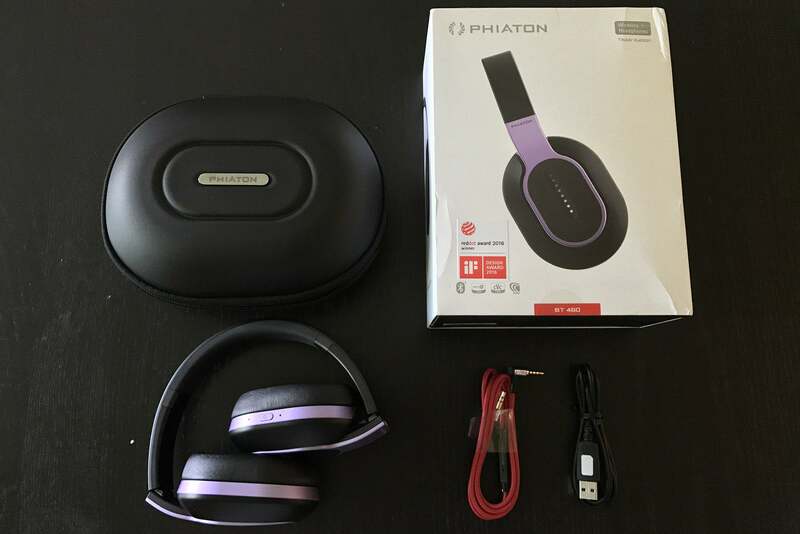 Phiaton attempts to express all of those virtues in the company’s BT 460 Bluetooth wireless headphones. My review pair came in the newly released violet color, affectionately called the “Teddy Edition” on the packaging. Opening up the package, there’s a clear nod to style in these headphones. There seems to be this consistent, almost perfectly symmetrical oval theme to everything in the headphones. The ear cups and the ear pads have the same symmetry. This extends all the way to the shape of the including carrying case, which expresses almost the same exact oval shape and ratio. It’s no wonder Phiaton won the iF Product Design Award, among others, in 2016. The violet-colored satin-finished accents on the headphones are rich. The angles and rounded edges of the different accented parts of the headphone are seemingly tailor-made to provide a visual interplay between light and shadows. When light hits the satin finish, it highlights the violet color without washing it out. When shadows fall, the accents take on a deeper purple color. 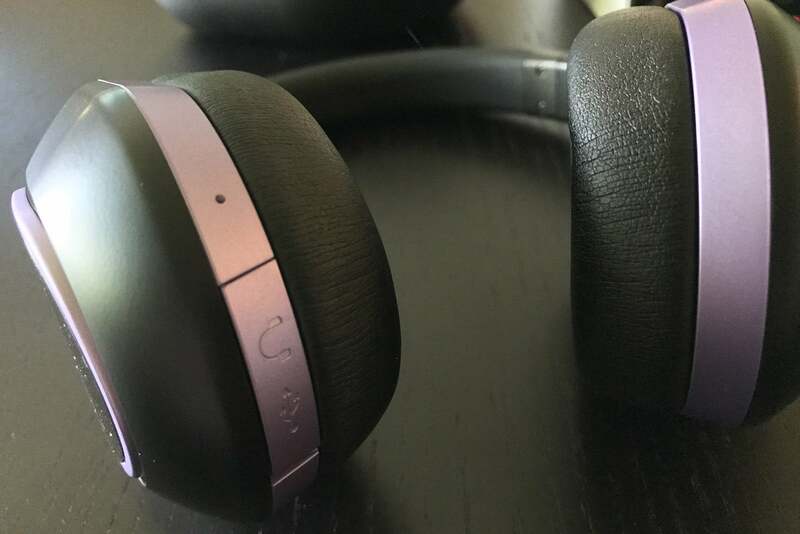 The headphones as a whole are very light (about 240 grams, sans cable) for their size and seem to be made primarily of plastic–including the head band’s click-adjustable mechanism. The underside of the plastic headband has a rubbery section that feels like its filled with air as opposed to a cushion material. The ear pads themselves are very soft and covered in imitation leather. They compress easily, are modestly sized, and shallow. When you wear them, you’ll feel your ears touching the ear pads and the soft part of the inner ear cup. Headband pressure is modest. If you shake your head back and forth, you’ll notice some play with the headphones on your head. Under the hood, there’s a 40mm driver, but Phiaton doesn’t specify what it’s made of. The company does say, however, that the headphones feature oversized neodymium magnets to control the bass response. The BT 460’s frequency range is rated at 10Hz to 27kHz, both well beyond the limits of human hearing. Impedance is 32 Ohms with a sensitivity of 99dB at 1kHz, which typically means that you won’t have any problems driving the headphones with a mobile device. The Phiaton BT 460 comes with a hard-shell carrying case, 3.5mm cable, and USB charging cable. the Phiaton smartly folds to a more compact form-factor for travel. Bluetooth 4.0 is onboard. You can pair the Phiaton 460 with two Bluetooth sources and toggle between the two. The feature is near instantaneous, too. For example, I was playing Led Zeppelin via my iPhone through the BT 460, and then started playing Pink Floyd on an Astell&Kern AK70. Once I paused Zeppelin on the iPhone, Pink Floyd almost instantaneously kicked on. The same worked in the reverse, though it took the iPhone a few extra seconds to kick in. You’ll get about 20 hours of music and call time and a whopping 110 hours of standby time with the Phiaton BT 460. A full recharge only takes about three hours via micro USB. The port is hidden on the underside of the right ear cup behind a plastic cover that easily pops off. Next to the micro-USB port you’ll also find a 3.5mm connection should you ever want to use the headphones in wired mode or if the battery runs dry. The inside of the cover also has clear plastic male molds for the female counterparts. This can make the cover a bit more difficult to close, but it stays on tightly. While the headphones aren’t IP-rated for water resistance, this added measure of protection should do a nice job of ensuring no stray water gets into these sensitive components. I liked this attention to detail. On the back of the right ear cup, you’ll find the headphone’s power button. If you clasp the ear cup with your right hand, you’ll need to slide your thumb up, because the power button sits higher than your natural tendency. The right ear cup also has lighted indicators that will animate to different patterns depending on what you’re doing and what the headphone status is. 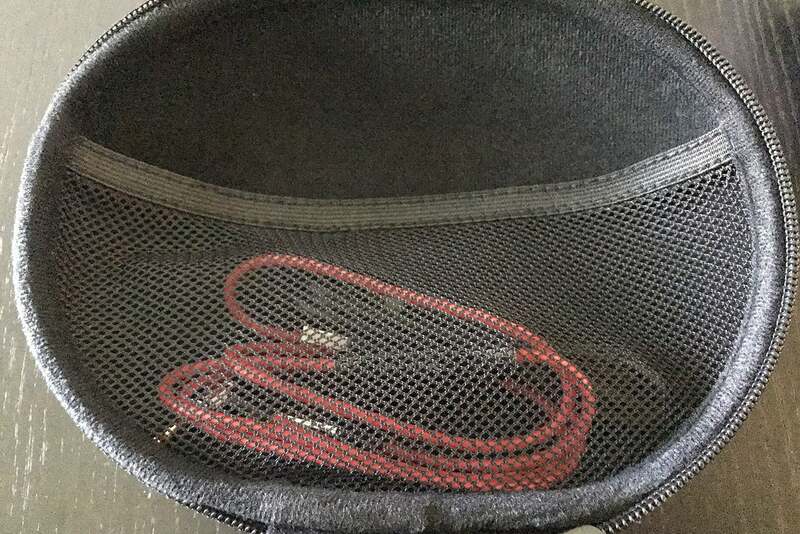 The Phiaton BT 460’s carrying case has a mesh pouch in the upper lid. I had no problem pairing the BT 460 with an Astell&Kern AK70 hi-res audio player and an iPhone 7. When I paired the Phiaton BT 460 with the AK70, it gave me an on-screen prompt that it had established a connection supporting the aptX codec, which delivers near CD-quality streaming over Bluetooth. Unfortunately, the Phiaton BT 460 doesn’t also support the aptX HD codec, which allows for streaming high-resolution music files. 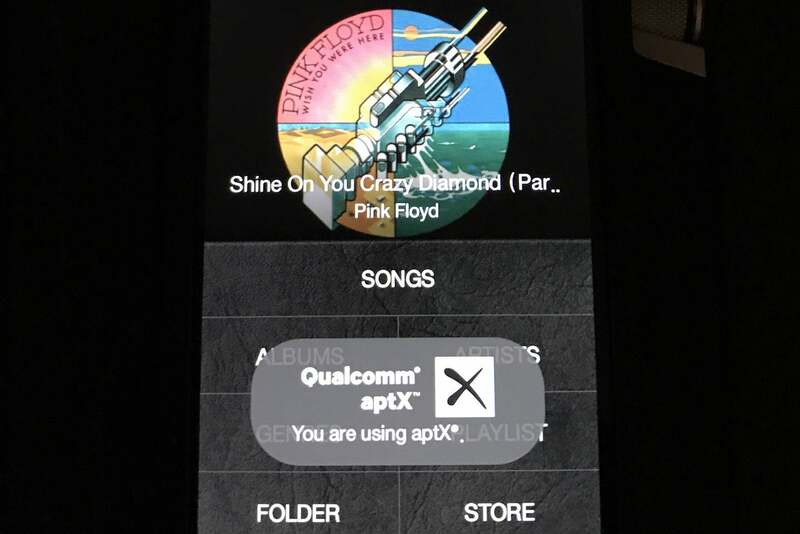 The Phiaton supports the aptX codec for near CD-quality streaming. The Astell&Kern AK70 recognized the BT 460 as an aptX-compatible device. If you think the Phiaton BT 460 is just another run-of-the-mill Bluetooth headphones, you’d be sadly mistaken. There are some really slick features that aren’t gimmicky. For example, if you take the BT 460 off your head, the music automatically stops playing and pauses on your player of choice. As soon as you put the BT 460 back on, the music starts right where you left off. It’s a really neat feature that Phiaton calls Smart Play/Pause. It didn’t always work flawlessly in my testing, unfortunately. In my experience, the headphones typically stopped playing when I took them off, but sometimes didn’t automatically start playing when I put them back on. I still liked the feature a lot. The bottom of the right ear cup (here shown on the left side) has a latch that exposes the micro-USB charging port and a 3.5mm analog input. The right ear cup’s surface doubles as a gesture control pad. Swipe up to raise the volume, swipe down to lower it. Swipe forward to advance the song and swipe back to rewind. Double-tapping will toggle play/pause or answer a call. Pressing the power button for about a second also functions as a play/pause toggle and will answer or hang up a phone call. The touch pad worked remarkably well. It was natural to use and I didn’t need to fumble with buttons. The gesture pad worked on both my iPhone and the Astell&Kern AK70 but this feature only works when you’re using the headphones in Bluetooth mode. Another neat feature is “Share Me.” With Share Me, you can share whatever you are listening to with another person who has a pair of BT 460 headphones. The feature doesn’t work with other headphone models. There are a few pairing steps you need to take with each headphone to get Share Me to work. While I couldn’t test the feature myself, this has several net applications. Imagine kids in the back seat of a long car ride being able to listen to the same programming off an iPad wirelessly. 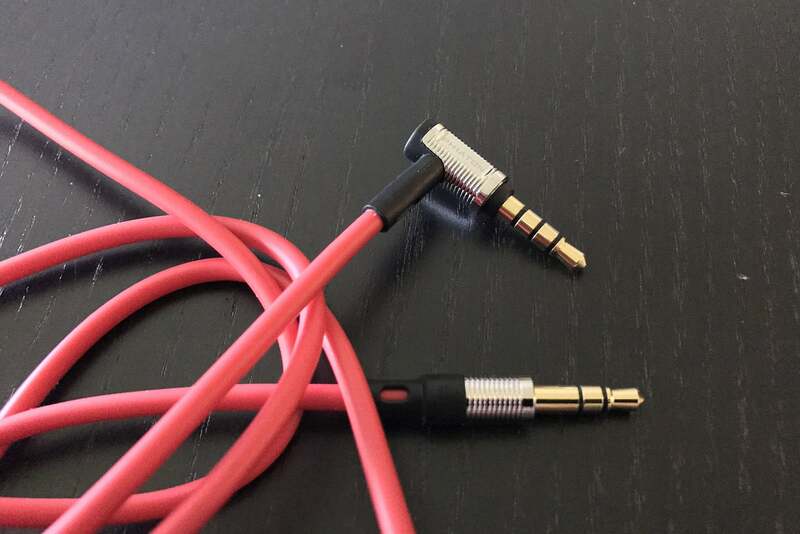 The Phiaton’s included cable is high quality with a 90-degree angle. The angled cable isn’t deep enough to fit through some smart phone battery cases. If a call is coming in while you’re wearing the headphones, you’ll hear the traditional ring as it pauses what you’re listening to. If, however, you have put the headphones down, they will start pulsing to give you an indication that a call is coming in. How many times have you put your phone on silent or had it in another room and missed a call? All these features won’t mean a lot if Phiaton didn’t deliver with the music. Thankfully, you’ll be delighted. I found the Phiaton BT 460 to be a solid performer. Musical reproduction tended to be warm and inviting. Jimmy Page’s ethereal guitar work on Led Zeppelin’s “I’m Gonna Leave You” was lush. Bowers & Wilkins Society of Sound has a high-res recording of Peter Gabriel Live in Athens that I like to kick on now and again. The Phiaton BT 460 did a really nice job of reproducing the music top to bottom. Highs were crisp, the midrange was clean and open, and the bass was well controlled without being bloated or exaggerated. Peter Gabriel’s classics, “Sledgehammer,” “Solsbury Hill,” and “In Your Eyes” were a joy to listen to. The right ear cup has a power button, which doubles as a play/pause toggle when the headphone is in Bluetooth mode. The BT 460s was an able musical performer for whatever musical genre I threw at it. Patricia Barber’s “Too Rich for my Blood.” Superbly recorded material like Chesky Records’ high-res issues of Rebecca Pidgeon’s The Raven, Alexis Cole’s Dazzling Blue, or City of the Sun’s To the Sun and All the Cities in Between shined. Phiaton’s BT460 headphones have a gestgure control pad on the right ear cup. I’m sorry to put a damper on the party, but if you’re expecting the Phiaton BT 460 to give you outstanding wireless performance, you’ll be let down. There’s a stark difference between the Phiaton’s wired and Bluetooth performance–even with aptX-based devices playing high-quality source files. In general, music had far greater dimensionality, clarity, and control with the wired connection versus Bluetooth. For example, when connected to the Astell&Kern AK70 via Bluetooth and aptX, the three-dimensional sound stage with musical selections collapsed. Bass notes and percussion instruments became thick and heavy. For example, drums the on “Solsbury Hill” from Peter Gabriel’s Live in Athens were noticeably bloated. The same was true on Hans Zimmer’s “Imagine the Fire,” from the Dark Knight Rises soundtrack. The Phiaton’s satin-coated headphones is sleekly designed. 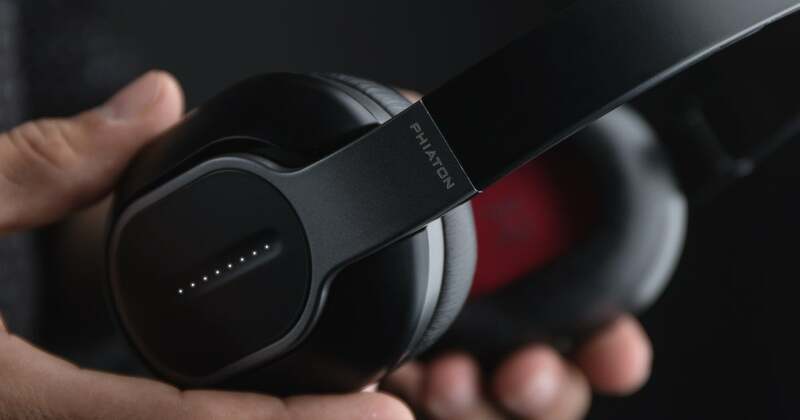 When all is said and done, Phiaton’s BT 450 headphones are stylish; have lots of features other Bluetooth headphones can’t dream of; and they just sound good–but only when you’re connecting them with a cable. Their Bluetooth audio performance is their major Achilles’ heel in my book. The Phiaton BT 460 is a great headphone that lives up to the company’s name. So long as you’re not expecting audiophile-grade sound when you go wireless, then you shouldn’t think twice about giving Phiaton’s BT 460 a very serious audition.